Ban on entry or women cannot be bracketed with issues relating managing of religious affairs as gender equality is a constitutional message, the Supreme Court said today on the contentious issue relating to Sabarimala shrine in Kerala. “Gender equality is a constitutional message and they (temple management) cannot say that this (banning women) comes under their right to manage religious affairs, a bench headed by Justice Dipak Misra said. The bench reiterated that it would test the so-called customary practice under the provisions of the Constitution. At the outset, senior advocate Indira Jaising, appearing for NGO 'Happy to Bleed' which is seeking women's entry into the historic shrine in Kerala, said the law was meant for removal of social ills and constitutional principles would prevail over discriminatory customs and beliefs. The ban on entry of women cannot be said to be part of the right to manage a public religious places like temple, she said and referred to various judgements to buttress her arguments. The right to enter a public temple is available to all Hindus irrespective of gender, she said, adding that any custom, belief or even law could be termed void if they do not conform to the constitutional principles. 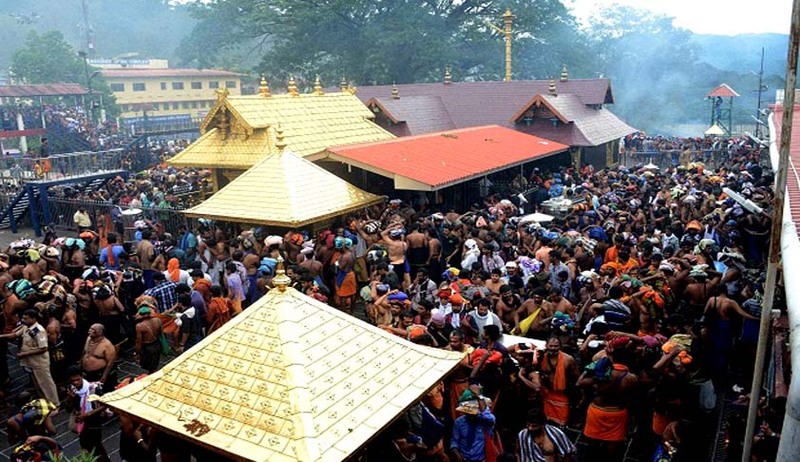 The Supreme Court had on April 13 reiterated its opposition to the ban on entry of women into Kerala’s famous hill shrine of Sabarimala saying denying the right to enter and pray in cannot be justified on the basis of traditions which violated constitutional principle. The bench had also for the time being did not agree to the demand for referring the entry ban issue to a five judge constitution bench. But Justice Dipak Misra heading the bench said in future if substantial questionis of constitutional importance arises, “it may consider doing so”. There was some drama when bench took strong note of the submission of senior advocate Indira Jaising that women have become neo-harijans of India for being denied entry in the temple. “Why do you say that? Don't compare like this...You are 'Aadi Shakti'. Women have created this generation. You must say that you are equal”, the bench observed, leading Jaising to withdraw her submission. The bench also questioned whether a physiological phenomenon (menstruation) can be a guiding factor for denying women entry in the temple. Jaising, arguing for NGO Happy to Bleed, submitted that women are part of the Hindu community and hence cannot be denied the right to pray in a public temple and moreover, that right is guaranteed under Article 25 of the Constitution. In Hindu religion, there is no denomination of a Hindu male or female. A Hindu is a Hindu, the bench said, adding that it would not deal with the customary belief that the bar on entry of women is in place to maintain purity of Lord Ayyappa deity. The apex court reiterated that it would decide on the right of women to enter the temple on the basis of constitutional principles. Jaising said that women cannot be subjected to differential treatment. Earlier, the court had asserted that it would decide on the right of women to enter the shrine on the basis of constitutional principles and not by the prevalent customary practices. We will now only be guided by the rationale under the Constitution. The gravity of this petition is that gender justice is endangered, it had said. The court is hearing a PIL, filed by Indian Young Lawyers' Association (IYLA), seeking entry of women in the Sabarimala temple, located on a hill-top in the Western Ghat mountain ranges of Kerala's Pathanamthitta District.